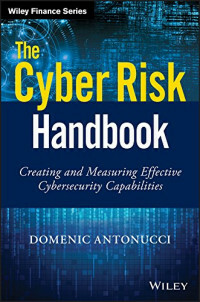 The Cyber Risk Handbook is the practitioner's guide to implementing, measuring and improving the counter-cyber capabilities of the modern enterprise. The first resource of its kind, this book provides authoritative guidance for real-world situations, and cross-functional solutions for enterprise-wide improvement. Beginning with an overview of counter-cyber evolution, the discussion quickly turns practical with design and implementation guidance for the range of capabilities expected of a robust cyber risk management system that is integrated with the enterprise risk management (ERM) system. Expert contributors from around the globe weigh in on specialized topics with tools and techniques to help any type or size of organization create a robust system tailored to its needs. Chapter summaries of required capabilities are aggregated to provide a new cyber risk maturity model used to benchmark capabilities and to road-map gap-improvement. Cyber risk is a fast-growing enterprise risk, not just an IT risk. Yet seldom is guidance provided as to what this means. This book is the first to tackle in detail those enterprise-wide capabilities expected by Board, CEO and Internal Audit, of the diverse executive management functions that need to team up with the Information Security function in order to provide integrated solutions. The need to manage cyber risk across the enterprise—inclusive of the IT operations—is a growing concern as massive data breaches make the news on an alarmingly frequent basis. With a cyber risk management system now a business-necessary requirement, practitioners need to assess the effectiveness of their current system, and measure its gap-improvement over time in response to a dynamic and fast-moving threat landscape. The Cyber Risk Handbook brings the world's best thinking to bear on aligning that system to the enterprise and vice-a-versa. Every functional head of any organization must have a copy at-hand to understand their role in achieving that alignment. This book examines the Internet of Things (IoT) and Data Analytics from a technical, application, and business point of view.